Welcome to Learners' Questions - the series where we answer your queries about the English language. What will this week's learner question be? Pablo in the Canary Islands says: can you explain to me the use of would in these sentences: I invited her to my house, but she wouldn't come. And, that's typical of you - you would go to the pub without leaving me a note! Hi guys! Dan from BBC Learning English here with this week's Learner Question. Find out what it is after this. OK! This week's learner question comes from Pablo in the Canary Islands, who writes: can you explain to me the use of would in these sentences: I invited her to my house, but she wouldn't come. And, that's typical of you - you would go to the pub without leaving me a note! Well, Pablo, in your first example, wouldn’t means refused to. I invited her to my house but she wouldn’t come, or, I invited her to my house but she refused to come. Although, if we use would in this way, it’s a little softer in tone and sounds more natural than refused to. Another example would be I could see that she was crying but she wouldn't tell me what was wrong. Would can indicate that someone insists on doing something, and this can be actively or as a typical form of behaviour, like a habit. We can use would like this when we’re being critical of someone in terms of their actions or behaviour. And note, that it has to carry a strong word stress to be used in this way. So your example was, that's typical of you - you would go to the pub without leaving me a note! Finally, won’t and will can be used to show refusal or insistence in the same way, but in the present or future. For example, he won’t eat his vegetables because he doesn’t like them or if you will eat so much, it’s no wonder you’re going to get fat. It’s worth noting that this is one of the few times that you can use will in an if clause in a conditional. I hope that answers your question Pablo. Thank you very much for writing to us. 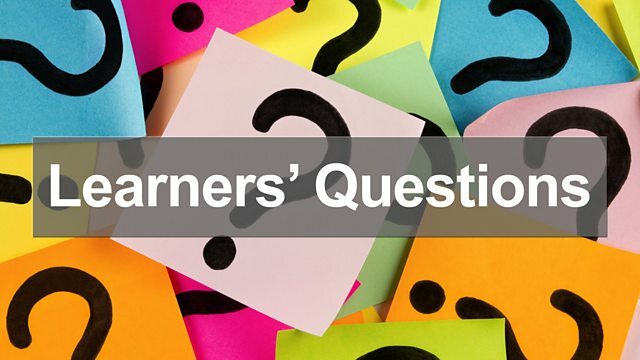 If anybody else out there has a question for Learners’ Questions, you can email us on: learning.english@bbc.co.uk. Please remember to put Learners’ Questions in the subject box and your name and the place that you’re writing from. I’m sorry, guys we can’t answer every single email because we just get too many, but we do read every single one. And for more information go to our website: bbclearningenglish.com. That’s it for this week’s Learners’ Questions. I’ll see you next time. Bye! Would can mean refuse to. Using would this way is a little softer and more natural than refused to. I could see that she was crying but she wouldn't tell me what was wrong. Would can indicate that someone insists on doing something, either actively or as a typical form of behaviour, like a habit. We use would like this when we’re being critical of someone. It has to carry a strong word stress to be used in this way. That's typical of you - you would go to the pub without leaving me a note! Finally, won’t and will can be used to show refusal or insistence in the same way, but in the present or future. He won’t eat his vegetables because he doesn’t like them. If you will eat so much, it’s no wonder you’re going to get fat. It’s worth noting that this is one of the few times that you can use will in an if clause in a conditional. Try our quiz to see what you've learned about this topic. What type of verb always follows would? Is this person being critical? Does it sound like John has done this many times? He would make us go back for them. Why doesn't John just keep his keys by the door. He'd never forget them! Is this in the present or past? Is this person being critical? Are they talking about a habit? Wouldn't can mean refused to. Can we use would in the same way? I gave him the money, but he would go. He didn't want to. Well, that's it for this unit! Join us again in Unit 16 for more Exam Skills, News Review, Pronunciation in the News, The Teachers' Room and Learners' Questions!